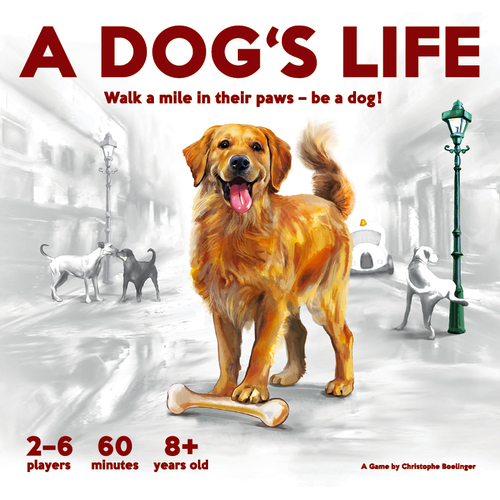 A Dog’s Life is a family board game from a designer probably best known for his more complex “gamer’s games” such as Archipelago, 4 Gods, and Dungeon Twister. I have certainly come to respect his complex designs over the years. This family game is apparently a reprint of one of his first titles – from way back in 2001 – now coming to Kickstarter this year. I remember playing that version many many moons ago, but not enough to remember any details. The game is meant to provide a simulation of what life is like as a dog… roaming around the city, finding bones and peeing on things. 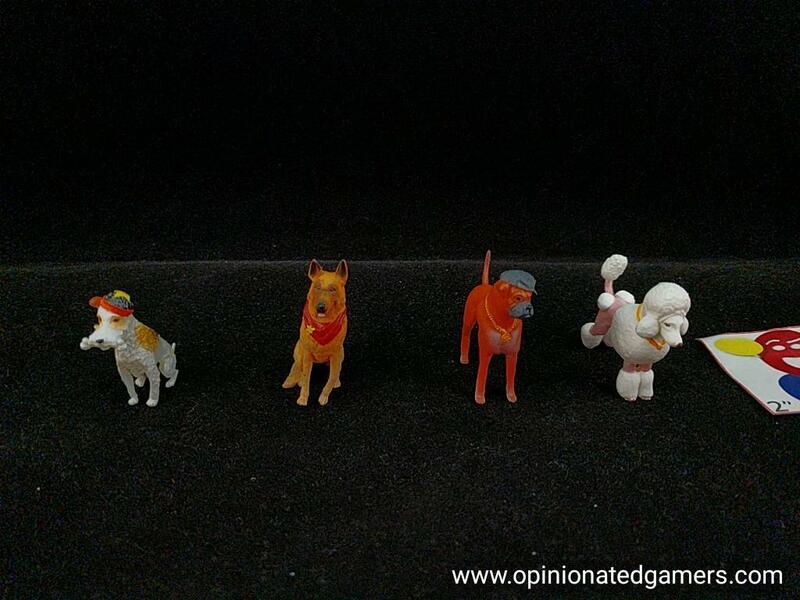 This new version has updated graphics and plastic dog figures to go with what appear to be a few updated rules. 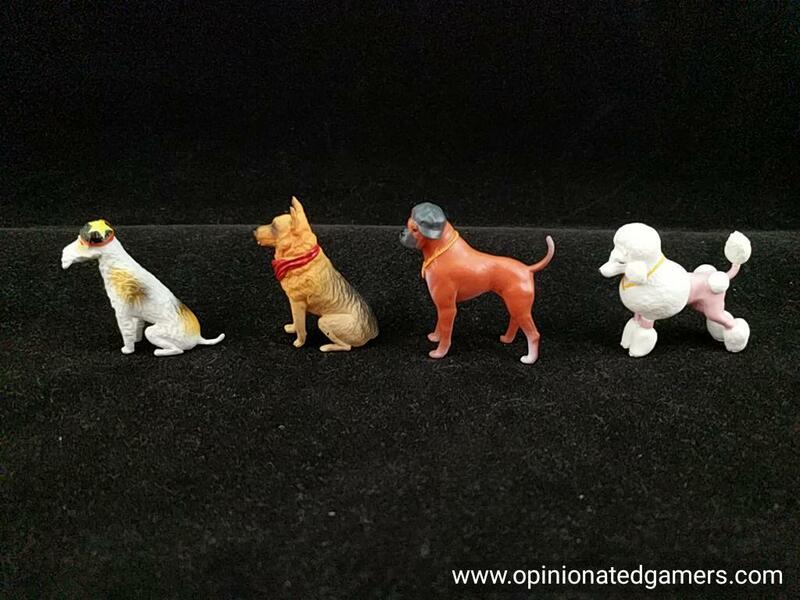 The player tokens in A Dog’s Life are actually small doggie miniatures, each realistically painted and unique. There’s a fox terrier, boxer, French poodle, German shepherd, Whippet, and labrador. The object of the game is for a dog to locate three bones and carry them safely back to his den. Well, its not exactly a home, as these are vagabond dogs who take up residence in playgrounds, circus tents, golf courses or construction sites! Bones tend to be found in trash cans and are sometimes given as rewards for successfully delivering newspapers to various establishments. Seems like even these runaways still know how to serve man and bring him his daily paper. Each player chooses a dog, takes the board for that dog. A den card is drawn at random for each dog, and that is where each dog will start. The food marker is placed on the #4 square of the Hunger track, and one pee counter is placed in the dog’s bladder. 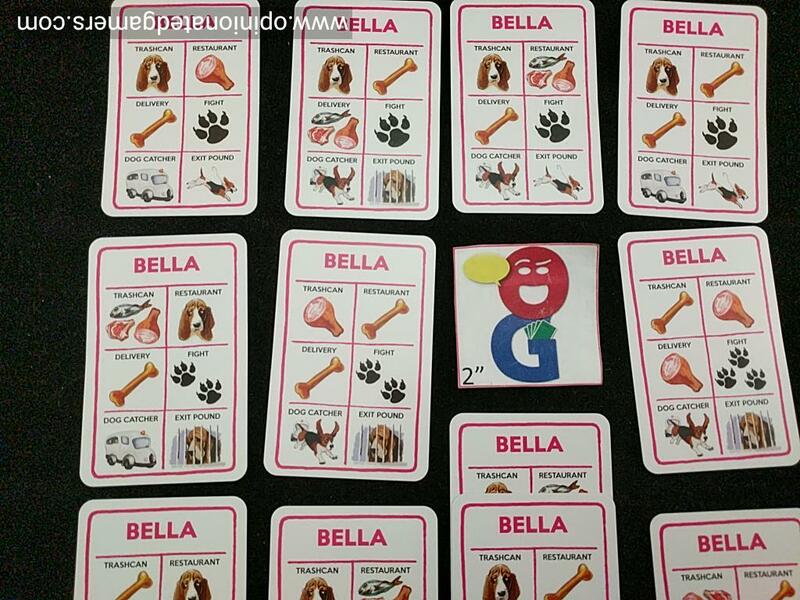 Each dog also comes with a deck of action cards; these are shuffled and placed as a deck next to the board. Your dog starts with an empty mouth, but never fear, there is room for two things (bones or newspapers) to be carried between the jaws of your canine representative. Each dog is adept at certain tasks, while found wanting in other tasks. For instance, the boxer (Romeo) is quite good at fighting, but obviously invokes little sympathy in the restaurant owners when he begs for food. Plus, since he’s so grouchy, he is kept under careful guard at the pound and has little chance of escaping. The delicate poodle, on the other hand, is so cute that those mushy restaurant owners just can’t resist giving her food or bones. However, she had better keep on the run as if she is forced to tangle with a rival hound, she will usually get clipped. On a turn, the first thing that happens is that the hunger counter is moved to the left (towards the zero). If it is already at zero at the start of your turn, your poor hungry dog falls asleep, drops everything that he’s carrying and ends up at the dog shelter, and the turn ends. Assuming you have enough in your belly to keep going though, you then move into the “Dog Stuff” phase. In the Dog Stuff phase, you have a number of actions ranging from 7 to 9, depending upon the type of dog – the number of action points is clearly displayed on the player board just underneath the name of the dog. With these actions, players can do any or all of the following at a cost of one action point each. 1) Move – 1 point per square. You can pass thru but cannot end your movement in a space with the dog catcher car or another dog. Buildings also count as spaces – they can only be entered where a dog paw is shown in front of an entrance. You cannot pass thru someone else’s pee counter. Like all good dogs, when you smell someone else’s tinkle, you end up stopping for the rest of your turn to get a good sniff in. 2) Dig in Trash Cans. There are about two dozen trashcans scattered about town, all reeking from garbage which is several days old. These are prime locations for both food and bones. Once a dog scrounges through a particular trash barrel, however, it cannot be searched again until following trash day, when all garbage is hauled away by the local sanitation department and fresh garbage becomes available. Trash day occurs once fifteen of the trash cans have been looted. Flip up a card and look at the result. You either get a sad dog face, a bone, or 1-3 food pictures. Move your food counter up one space per food picture; you can never have more than 4! 3) Beg for Food. Apparently, stray dogs get hungry fast and must keep a careful eye on their hunger level, which drops each turn. Dogs are forced to search for food in trash cans, beg for it at local restaurants or deliver newspapers in hopes of receiving a reward. Flip up a card and look at the result. You either get a sad dog face, a bone or 1-3 food pictures. Move your food counter up one space per food picture; you can never have more than 4! 4) Pick up a Newspaper. Apparently the dogs have learned that by delivering newspapers to their designated locations, they often receive rewards (food or bones). Newspapers are retrieved at the kiosk, which is located in the center of the town. Each newspaper has a number on the reverse indicating its target destination. When a dog successfully delivers the newspaper, he receives his reward – same as with restaurants and trashcans. 6) Drink Water from a Fountain. Players can use an action point to lap away at the public fountains and refill their bladders. You can use two points to fully refill your bladder if you were empty to start with. 7) Fight. Life on the street is tough. It’s a dog-eat-dog world out there, so one best beware. If two dogs come to rest on the same location, they must fight. The loser drops all of the items he was carrying (newspapers and/or bones) and is thoroughly humiliated and forced to retreat one space in the opposite direction as the victorious dog. If the attacker loses, his Dog Stuff phase ends immediately. 8) Pick up Dropped Items. Thanks to the bloody results of dog fights and the diligent work of the persistent dog catcher, there is usually an appreciable amount of items scattered about town just waiting to be retrieved by the hounds. Each dog can carry two items at any one time, so newspapers are occasionally dropped to make room for more valuable bones. 9) Bury Bones. This is the true reward: the finding and successfully burying of bones. Once buried at the dog’s home, a bone is safe from harm. The first player to successfully bury three bones in his den is Top Dog in the neighborhood and wins the game. Once the Dog Stuff phase is over, you now get to move the Dog Catcher. A d6 is rolled, and the Dog Catcher must move that number of spaces. Orientation is important! The car can only move straight ahead or turn left or right; it cannot go backwards! It must move the full number of spaces on the die. If it ends on a space with a dog, that dog is captured and sent to the dog shelter. Anything in its mouth is dropped where it is caught. If it ends on a space adjacent to a dog, those endangered dogs must flip over their top action card to see whether they were able to successfully hide from the dog catcher or if they too are caught. 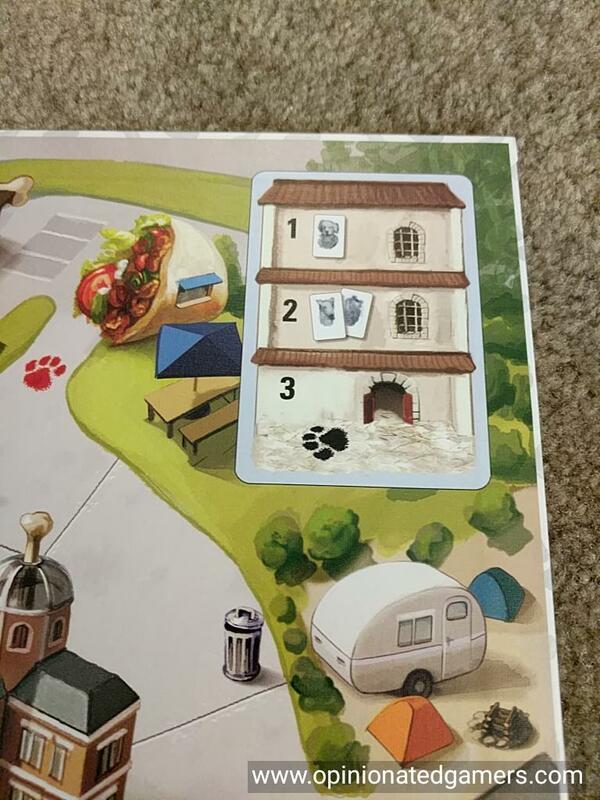 The dog shelter has three spaces (see the upper right corner of the board). All dogs start their stay in the top space – numbered 1. At the start of their next turn, they do not have to lose a food counter because they’re being fed in the shelter! You flip up 1 card from your deck and see if you escape the pound. If so, take your turn as normal, starting from the dog shelter space on the board. If not, move down to the number 2 space. Your turn ends now, but on your next turn, you will flip up 2 cards – if you get an escape on either, you leave the pound. If you fail this second time, you then move to the number 3 space, and you will automatically leave the pound at the start of your next turn. Whenever you leave the pound, you will have your hunger counter set on 4 (must be a kibble buffet at the shelter) and one piddle counter on your board. The game continues until one player has managed to bury three bones in his den. The game ends immediately at that time. A Dog’s Life is getting a new lease on life with this 2017 Kickstarter release. I’ve had a decent time with it when playing with casual gamers and some younger kids. The game clearly advertises itself as a “family game”, and when played with the target audience, I think it hits the mark. The rules are honestly quite simple, and for the most part, you can tell kids that they can do things on the board if they can see them. 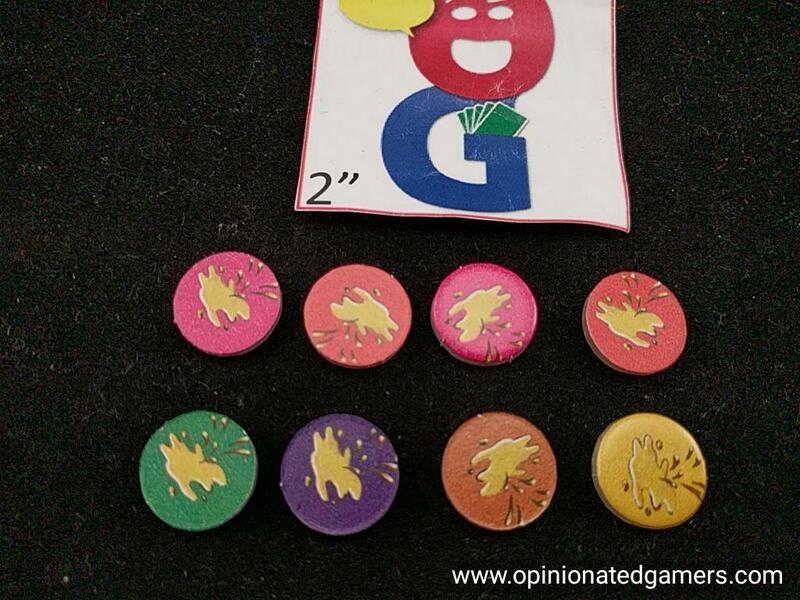 Sure, there are 9 different options during the Dog Stuff phase, but it is really quite intuitive, and even the youngest gamers that I have tried this with did not have any issues with the rules. 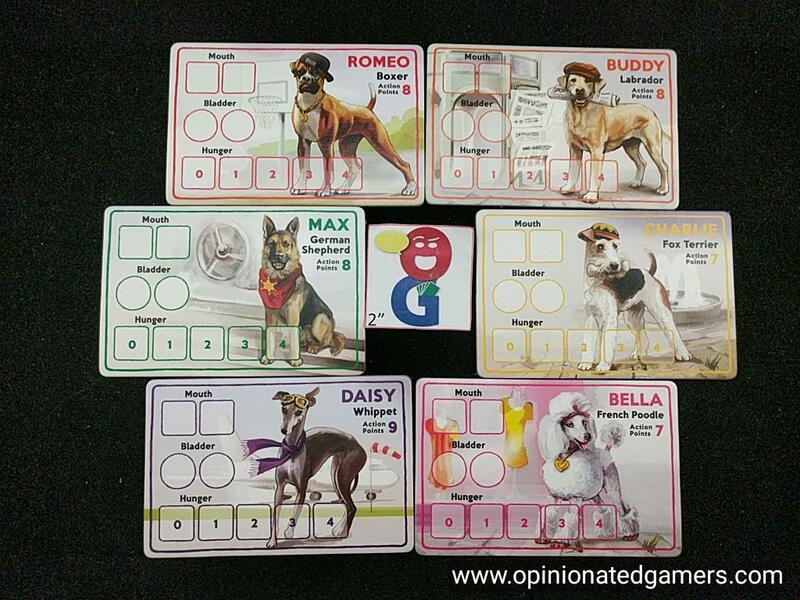 I like the way that the doggie decks give each breed a different personality (in the way that each has a slightly different probability of outcome for each action). For a casual game, flipping over the top card of the deck is an easy enough way to randomize and personalize the outcome. 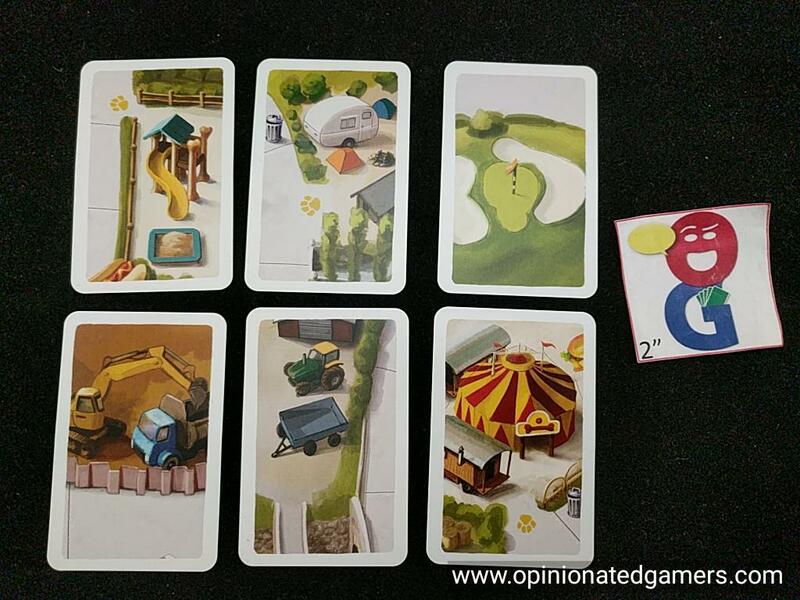 I’m sure that a veteran gamer could “game the system” by knowing the distribution of all six actions and closely monitoring the discard pile – but for a casual game, it’s a pleasant surprise to see the outcome of your chosen action with the card flip. After you’ve played the game a few times, you get a pretty good feel for which dogs are better at which actions. Heck, I know that the kids that I’ve played with learned quickly! In our first game, we spent a frustrating amount of time in and out of the dog pound. Your dog only gets one chance to move on its turn, and then the dog catcher gets 3 or 4 d6 worth of movement before you move again… As such, it was inevitable that the doc catcher would find you! However, we soon figured out that you could escape scrutiny by ending your turn in your den or within a building (restaurant/delivery destination) – as long as you have a newspaper for that location! And now, most of our turns are set up so that we end our movement in a safe spot, or at least as far away from the dog catcher as possible. Most dogs have about a 50/50 chance of avoiding capture when adjacent to the dog catcher, so sometimes you just have to take the risk! On the other hand, sometimes it’s not so bad to get put in the shelter, as you replenish your food count to 4 and get a piddle counter. It’s not bad compensation for the possible loss of a turn or two. The components are well done. 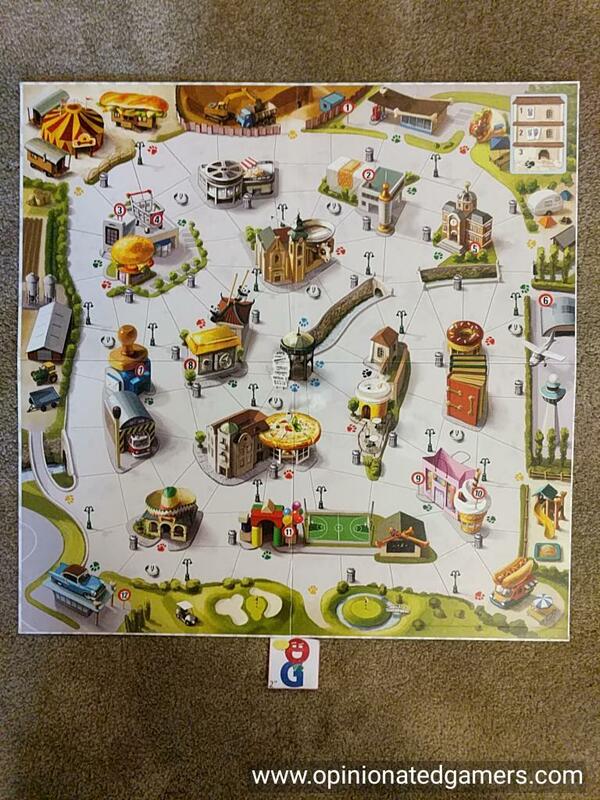 The board shows a nice neighborhood, and the paws on the board show you where you can enter/exit buildings. The icons on the cards are pretty clear, and as long as there is one adult around, it’s easy enough to explain what the different icons mean. (i.e. for the dog catcher, you get a picture of the dog catcher van or a dog running free – but no words to explain the meaning). The miniatures are nice and detailed, and the younger gamers have always wanted to play with the figures even after the game is done. My only quibble with the components is that the red and pink pee chits are very similar in shade, and my old-person eyes have had a bit of trouble distinguishing between the two. Most everyone else hasn’t complained about this, so maybe I’m just starting to get colorblind or something…. Red and pink alternating on the top row. Can you tell them apart? I remember that the original version of the game went on too long. I believe the goal then was to bury 4 bones. This updated version of the game only requires three bones to be buried, and this helps keep the game length at something more manageable for younger gamers. To be honest, I think the game might even still work fine with only 2 bones being needed (or maybe handicap young gamers with one in the den to start off?). We had some issues with the eight year old being able to remember how many actions he had – so I’ve added a few colored cubes to be used as a pool – he puts one back in the box for each action… With this small addition, everything has gone swimmingly. Our 4p games are now coming in around 40 minutes, and that should be a good length for a family game – definitely not too long for the eight year old, but right at the edge I think. I doubt that I’d bring this out often with my regular gaming group, but this isn’t the sort of game for them — In the same way that I wouldn’t bring out Agricola for my non-gaming neighbors and their 8 year old. The action choices are quite simple, and there isn’t much of a story arc. But, for the right group, this is a wonderful simulation of what life is like as a dog, and a pleasingly simple game to play. Definitely recommended for kids and their families. Yay. They kept the term “piddle”. I did the translation on the original version, and had to figure out how to translate “la pis du chien”. I used Sandi’s preferred word. I remember being extremely disappointed with the original. I don’t even think a full game was completed. Its a great theme so I hope that this revised edition offers a better experience.